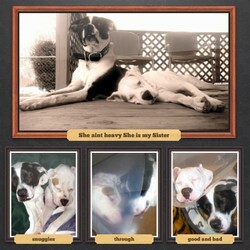 I had fostered for numerous rescue groups before joining Austin Boxer Rescue in 2011. On the back burner my mission in fostering was to find a forever friend for my Dog… After 30 + dogs passing through our home Dot found us! The bond between these 2 was quickly apparent! and we thank ABR for saving this special girl that we love so much!